We’re very excited to start work on a one-year project funded by the Leon Levy Foundation [LLF] to ingest and process our legacy digital removable media! This project builds directly on the success of last year’s National Digital Stewardship Residency [NDSR] Project. However, while that work focused on electronic records that are just now being transferred to the Archives, the LLF project will allow us to work with digital materials that had been previously transferred to the Archives as part of predominantly paper-based collections. A few of the legacy digital media items from the WCS Archives. 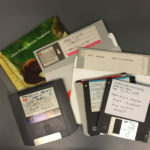 These digital materials are contained on removable media that is in some cases already obsolete, such as 5.25 inch floppy disks and Zip disks; in other cases, such as CDs and DVDs, the unstable nature of the media threatens the accessibility of its contents. From what we know of the content—based on labels and our ability to read some of the more common formats—it dates from the late 1980s to 2015. As such, this content covers a long period of significant growth in the history of WCS. During this period, WCS re-opened the three ‘City Zoos’ (the Queens, Prospect Park, and Central Park zoos), developed several major exhibits at the Bronx Zoo and the New York Aquarium, and consolidated its conservation efforts into an institutional program, shifting from its past system of sponsoring individual researchers working on field projects to employing full-time staff engaged in developing permanent country-based programs. We’ve hired Caroline Gil—a recent graduate of NYU’s Moving Image Archiving and Preservation program—as the Digital Project Archivist on this grant. Caroline’s now in her second week of work, and will be with us until September 2017. Starting in November she’ll be posting here on Wild Things every other month to give updates on her progress. We’ll be looking forward to her comments! Congratulations on receiving the Leon Levy Grant. 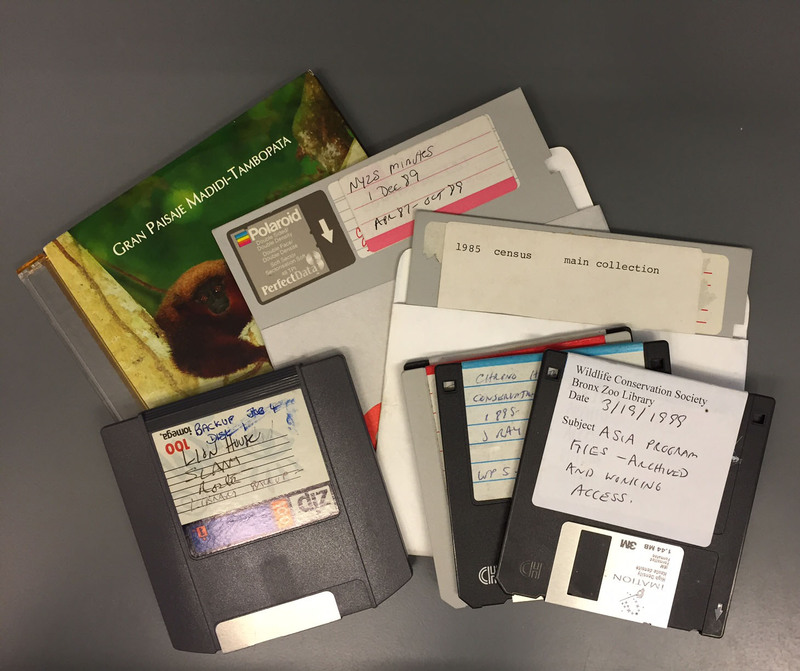 In addition to my pleasure at the continued success of the archives program at WCS, I was started to recognize the examples of obsolete digital media displayed with the October 11th blog entry. Four of the disks include my handwriting on their labels; I typed the label on the 5.25 inch floppy disk. The zip disk apparently contained a backup of the notes I made on the history of the Lion House, as part of my “devil’s advocate” work on structures included in the then pending proposal to landscape buildings in the Bronx Zoo. The staff minutes were edited notes of the once monthly NYZS “Society” staff meetings, as distinct from the weekly “Animal Department” meetings held in the same time slot on other Thursdays. Printed copies of those staff minutes should be in the archives, shelved with other meeting minutes and notes going back to 1939 or so. Thanks for the great comment–it’s wonderful to find out more about the contents of these disks! Also good to know that at least one of the disks holds duplicates of what’s in our print collection; this kind of information helps us prioritize the materials.